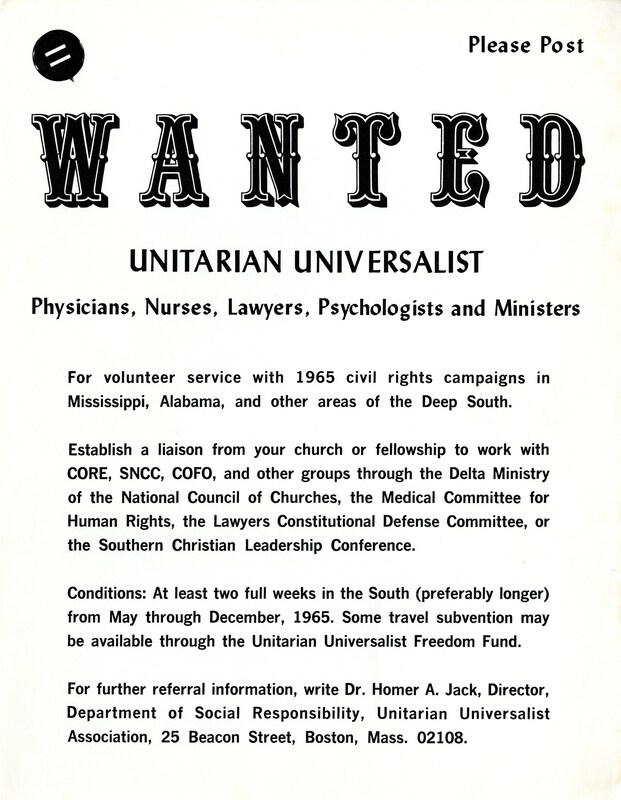 WANTED: UU Physicians, Nurses, Lawyers, Psychologists and Ministers, 1965. During the 1960s, the UUA’s Department of Social Responsibility recruited volunteers to travel to the South and assist in civil rights campaigns. Hundreds of Unitarians Universalists answered the call and partnered with local groups to help register voters, organize, and march. Answering this call was dangerous and two Unitarian Universalists—Rev. James Reeb and Viola Liuzzo—were murdered for participating in the Selma to Montgomery Marches in 1965. For volunteer service with 1965 civil rights campaigns in Mississippi, Alabama, and other areas if the Deep South. Establish a liaison from your church or fellowship to work with CORE, SNCC, COFO, and other groups through the Delta Ministry of the National Council of Churches, the Medical Committee for Human Rights, the Lawyers Constitutional Defense Committee, or the Southern Christian Leadership Conference. Conditions: At least two full weeks in the South (preferably longer) from May through December 1965. Some travel subvention may be available through the Unitarian Universalist Freedom Fund.